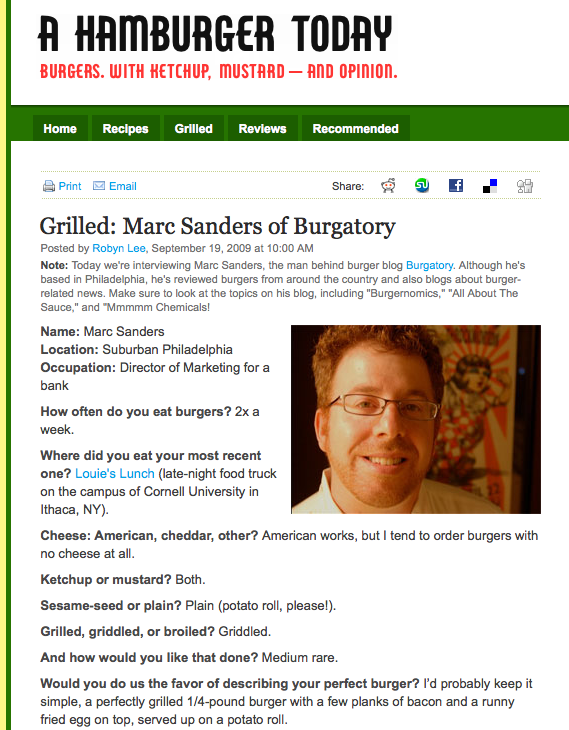 Editors note: I am honored to present the first guest post ever here on burgatory.com. Penned by good friend and world-class BBQer, baker, chef and eater, Jim Caccamo, this post is guaranteed to make your mouth water and have you running to a map to figure out exactly where Missouri is (we know it’s there somewhere – in the middle, right?). Look for Jim’s own blog about Technology & Ethics kicking off later this fall. I’ve spent the past twenty years living in beef towns. Chicago, with its Vienna Beef dogs, and Philadelphia, with its devotion to the Cheese Steak, certainly have their charms. But I grew up in the land of bar-b-que–Kansas City, Missouri. Now, I don’t know much about my new home here on the east coast, but what I do know is that few people from Philly know much about my home town. For most people around here, KC is one of those generic places in the thousand mile “flyover zone” between here and the west coast. If people have a sense of it, they think of it as a cow town. Of course, it’s not a cow town. When I was growing up, it had a population of more than 2.5 million people. The stockyards had long given way to 4 professional sports teams, ballet, opera, and world class art museums. That, and we ate pork, not beef. Bar-b-que, to be specific. There were some good burger places, no doubt. Winstead’s made thin, melt in your mouth burgers. Town Topic did the perfect all-night-diner burger. But Kansas City was a bar-b-que town, with pork ribs at the top of the luscious hickory-smoked, mopped, and rubbed heap. Today, the city’s food landscape has changed. Don’t get me wrong, bar-b-que is still king. But the city has undergone a dining-out revolution, and now there is a veritable royal family of great restaurants that serve excellent contemporary American cuisine, local favorites, and foods from around the world. Into this mix comes Blanc Burgers + Bottles, a burger place in the Westport neighborhood that opened in 2006. Blanc is an independent boutique-burger restaurant that focuses on quality. Their menu is trim, focusing on burgers, fries, and beers. The beer selection is great, with a variety that is balanced between local, national, and international microbrews. They do a few appetizers and some great “adult” milkshakes (see later). But the focus here is the burger. Their beef burgers are half-pounders made from a custom blend of tenderloin, ribeye and NY strip steak. They are going for the taste jugular. The buns are baked daily at a local bakery. They make their own pickles. They do hand cut fries and sweet potato fries, and local brew Boulevard Pale Ale battered onion rings. To top the fries, they make their own ketchup, whole grain mustard, and chipotle aioli, all of which are vibrant and flavorful. They do offer bison, pork, turkey, mahi mahi, and lentil burgers, but I didn’t try them, so I can’t help you there. My wife and I went there on a Sunday evening in June. We got there at 6ish, which turns out was perfect—right before the rush. Blanc’s design is Danish modern–sleek, clean, and cool. I decide to go basic, so I ordered a “classic”: aged NY white cheddar, lettuce, tomato, homemade pickles, red onion, “made-from-scratch” ketchup and mustard on a sesame brioche bun. My wife went a bit fancier with a steakhouse classic, getting the “au poivre”: pepper-crusted burger, creamy green peppercorn sauce, grilled onions, watercress, on a salt and pepper brioche bun. In short, the burgers were wonderful. They were rich and full of meaty flavor. They were buttery and light owing to the ample portion of fat, and definitely drippy. Eating a Blanc burger is a full sensory experience. One nice touch was that the burgers were very balanced. My “classic” (pictured at top of post) had lots of toppings, but the toppings did not overwhelm the meat. I could taste each of the toppings, and nothing stood out too much. The homemade ketchup and mustard seem to be made to share the palate well. The pickles were perhaps the best part: meaty, juicy, and full of flavor, but without such high levels of dill and vinegar flavor that they overwhelm the other flavors. You could still recognize them as recently being cucumbers! Heck, I don’t even like dill pickles and I liked these. And even with all the toppings, the burger still tasted meaty. My wife, who has no particular devotion to the burger, said that she had never tasted better. The meat was good and it was “drippy in a good way.” The burger was crusted entirely in peppercorns, but the pepper was not as overwhelming as one might imagine. It was flavored nicely, with the pepper adding a bit of bite to cut through the juicy meatiness. The creamy green peppercorn sauce rated a “mmmmmmm.” Finally, the toasted brioche bun was a nice touch. Again, a well-balanced burger, full of flavors, with no element overwhelming the others. She recommends eating only half the burger so you will have room for dessert. Even the day two portion tasted great. Which brings us to dessert. The only desserts they offer are shakes. We ordered two “Grown-up Milkshakes,” which are intoxicating combinations of Foo’s Fabulous Frozen Custard and various spirits. My wife worked at an ice cream shop growing up, so she has a profound devotion to the milkshake. She ordered a “Sangria”—red wine, vodka, fruit juice, and vanilla custard. I ordered the “Cherry Cordial”, which I don’t remember completely, but included Malibu rum, marschino, some Absolut flavored rum, and chocolate custard. Joyce’s was excellent. It was light, refreshing, and had a wonderful flavor that hinted at sangria. Mine tasted exactly like a chocolate covered cherry, but better. Warming and cooling at the same time. Wow. As my wife put it, it seemed a bit “sinful to have alcohol in a milkshake.” This is no soda-fountain shake. They also make a beer float—pick any beer on the menu and add frozen custard. That’s what I’m having next time. The only down-side to the whole experience was that these burgers are rich—very rich. Dripping in juicy meatiness rich. Indeed, they seem to have adopted the “get your hands dirty” aesthetic that is standard at the bar-b-que joints. There is no mistaking that this is beef. I ate the whole thing, but I sure didn’t need to. My wife made a much wiser choice to eat only half of her burger, leaving more room for a milkshake. Not that it stopped me from having one, too. Both Joyce and I recommend Blanc the next time you are in Kansas City. Even if you’ve come to town for the sole purpose of finding the perfect bar-b-que, its good enough to be worth taking a break from all that pork. Oh thank you! I love reading about burgers. I’ve been meaning to read “Selling them by the sack”, its about White Castle.